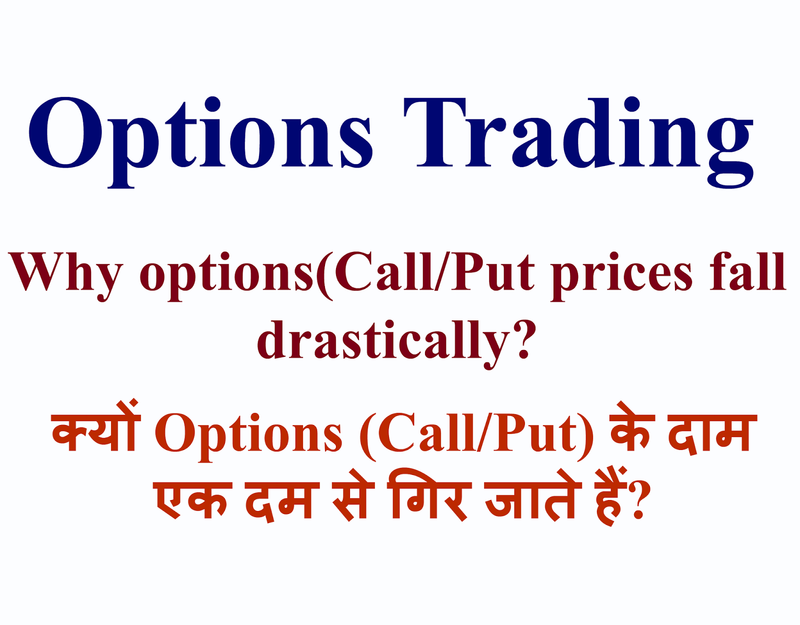 Options Trading |Why Options prices decrease? If you trade in options then probably you might have experienced that the prices of call and puts decreased drastically after a particular event in a stock. Such incident happens due to one factor (you will come to know later in this article). 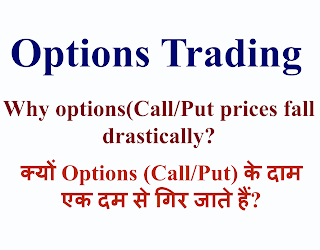 Now, the factor, due to which the prices of options suddenly decrease, is Implied Volatility (IV). When there is particular event like quarterly results of the company traders start building positions in calls and puts just one day before the results, thus the demand increases over supply which pushes the implied volatility on a higher side. The implied volatility (IV) decreases as soon as the results of that particular stock are declared which causes drastic decrease in the prices of the options (call & put) due to which the prices of the options do not increase or decrease in comparison to previous day’s prices even if stock performs better than its previous day’s performance. From the above example, you can see that on 13th Oct 16, the call of 1060 strike price was at 32 when stock made a high 1058 but on 14th Oct 16, when stock had made a high of 1082 (Rs.24 higher than previous day’s high price), the call only went upto 37. The main reason behind that was the Implied Volatility (IV) which was @37.50 on 13th Oct 16 but decreased upto 26.50 on 14th Oct 16. Had the IV remained at 37.50 on the result day the call of 1060 would have been @45 when stock’s price was 1082. Now, you may have learned that how IV affects the prices of options, so before taking any trade in future in any stock before the event day just check its IV if you find it unreasonably on a higher side than you should be little extra cautious. You can also watch the full video. Nice information shared on this blog, For any kind of information related to trading then visit Binary Options Brokers to get detailed information on option brokers.